The Three Sisters (Boatwif’s three sisters, that is) had generously donated monies for theatre-going in recognition of a significant half decade birthday. The birthday was months ago; tickets for Stratford plays* were booked weeks ago. After three days back in Stratford during the second week of January it has to be announced that the town and theatres retain their allure. A boating holiday – yes! Not an open boat with an outboard motor to catch mackerel from, not a sea cadet canoe, not a sailing boat, not a Cleddau-crossing ferry, those being the boats of our childhoods. 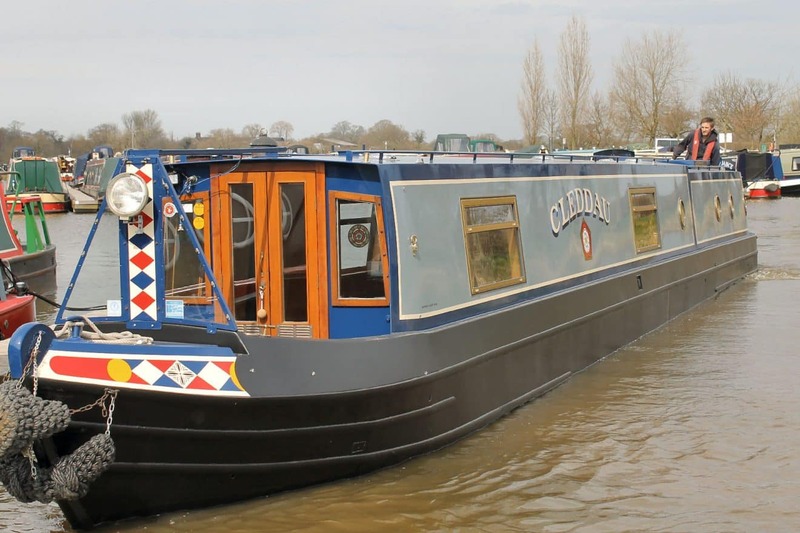 After camper vans and tents the sheer space of a narrow boat would be luxury. What fun it would be! So, for an energetic week (yes, it was energetic), the sweet little nb Angela Jane became our home. We were early at Stratford Marina; it seemed hours passed before finally the boat was untied and we moved out of the boatyard, under first one, then another bridge and turned sharp right into Stratford Lock. Then followed an unforgettable fifteen minutes, terrifying and mortifying in equal measure. An order was barked and up the lock ladder darted first the boatyard engineer and then the husband. “Pass the ?? up,” came the next instruction. The what? What’s that? Where? Eventually a windlass was identified and passed up. The husband was inducted into the mystery of paddle operation. It was high summer, late on a hot Saturday afternoon. Crowds surged around the lock, hundreds of cameras clicked and whirred at the sight of a boat rising in the water. Voices and faces of all nationalities; strange languages; then more instructions in English came from the lock side – but what did they mean…? Did ever a crew with such little knowledge of canals and locks set off in such a public place? The lock operation was completed; the engineer disappeared through the crowds and the husband jumped back onto the boat. The Angela Jane set off, weaving her way across Bancroft Basin, heading for that head-bangingly low bridge in the corner, access to the Stratford Canal. It was a steep learning curve for us all: locks, paddles, windlasses, aqueducts, tunnels, locking ahead, rivers… Gradually confidence grew. The fifteen year old was strong, efficient on lock flights, eager to steer. The twelve year old was keen to play her part and a superb map reader. It stopped raining late on the second day and the magic of canals embraced us: narrow lock chambers, ducks that hopped aboard to ride up the locks, barrel-roofed cottages, sheer elation at conquering lock flights. Six days later, the Avon Ring was completed and we cruised in glorious sunshine along the Upper Avon river towards Stratford and moored by the park, not far from the Royal Shakespeare Theatre. What luck, what joy: that night two of us sat perched in the gallery of the Swan watching Romeo and Juliet. What better play or venue to give a daughter her first tasting of Shakespeare? The second day of the 2013 visit was to be Walk Day: River? Canal? Other? Canal won. On with the walking gear, a flask of tea in a backpack and off to the station. Two singles to Wootton Wawen, a request stop. Six miles out of Stratford we walked the half mile from Wootton Wawen station through the village to the canal. There was the short iron trunk aqueduct and the large Anglo-Welsh hire boat fleet. No signs of life, no engines running, no smoke emerging from boat chimneys. The sun was low, the towpath mud thick… Along the path we walked, slipping and sliding, squidging and squelching. Then the Edstone Aqueduct was reached – the longest aqueduct in England. There were a few other walkers – but no boats, not until Wilmcote, and those all moored up for winter. Two years ago on this walk there had been a work boat crunching through the ice floes: this time temperatures were mild until the sun began to drop low in the sky. Downhill, down the locks, the town at last coming into view. There were Captain and Boatwif reminiscences: do you remember how this pound is always low in water? Do you remember how we made tea for the chaps re-pointing the first lock in summer 2011 – and a queue of boats backed up behind us…? By mid-afternoon the town centre was reached. Across the other side of Bancroft Basin stands the tall new tower of the RSC. Two more plays* seen and it was time to leave Stratford. We drove back eastwards towards Coventry, joined the A45, the M45, the M1. A short diversion. A short towpath walk along the Northamptonshire Grand Union and there she was, a boat, nb Valerie. How good it felt to be back afloat. The fire was stoked, the kettle on. Les and Jaq gave us a grand welcome and for a couple of hours we chewed our favourite topics: marinas, lock closures, cruising plans, US and UK citizenship – and, of course, composting loos! 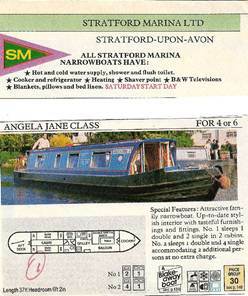 Stratford – a perfect blend of boating memories and theatrical experiences. * (in the Royal Shakespeare Theatre)The Merry Wives of Windsor, played against a 2012 setting, a side-splitting farce involving Falstaff’s foiled bid to seduce the wives of two of Windsor’s wealthy citizens (show closed on 12th January). *(in the Swan) The Orphan of Zhao, an adaptation of an ancient Chinese tale in which a brave doctor protects the life of the imperial heir, though at huge personal cost (until 28th March).